There are no surviving tabors from before modern times. Based on pictorial evidence, it is clear that since the beginning of the 16th century (perhaps earlier) the construction and dimensions of the tabor have not altered much, if at all. Historically, the tabor was often played together with a type of recorder called the pipe. The pipe was played with one hand (there are tone holes only for two fingers and a thumb) and the tabor with the other. See illustrations in both this article, and in "Todays Tabors"
The origins of pipe-and-tabor playing are still unclear, although an early concentration of activity was in the western Mediterannean (France, Spain, Balearic Islands), where it survives to the present day as a continuous, living tradition. The earliest depiction of a pipe-and-tabor player of which I am aware is a wall relief of the Oliva monastery in Navarre (present-day Spain) dating from the 12th century. Throughout the 12th-15th centuries the tabor is encountered almost exclusively with the accompanying pipe. It was relatively small, with the shell being perhaps 3-6" high and 8-10" diameter. The year 1511 saw the first printed book dealing with musical instruments and their usage. 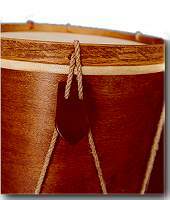 Of the several such publications which appeared over the succeeding 125 years, four have provided the the basic designs of tabors offered by Harms Historical Percussion.